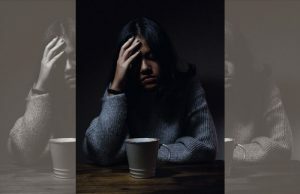 MANILA, Philippines — More than half of all Filipinos disagree with the often heard claim that “persons who use drugs or are involved in the illegal drug trade do not have the capacity to change anymore” but the split in opinion was narrower on the question on whether it is right to kill such people. 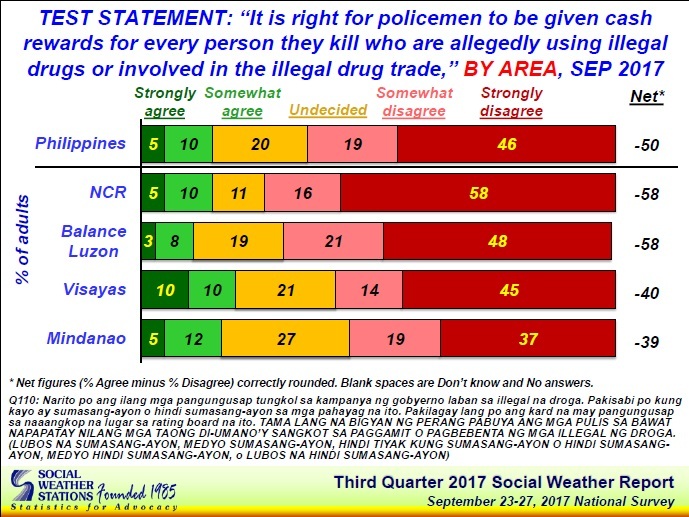 The latest poll of the Social Weather Stations, part of its Third Quarter 2017 Social Weather Survey, also showed 65 percent of respondents disagreeing with the idea of giving cash rewards to policemen for every drug suspect they kill. 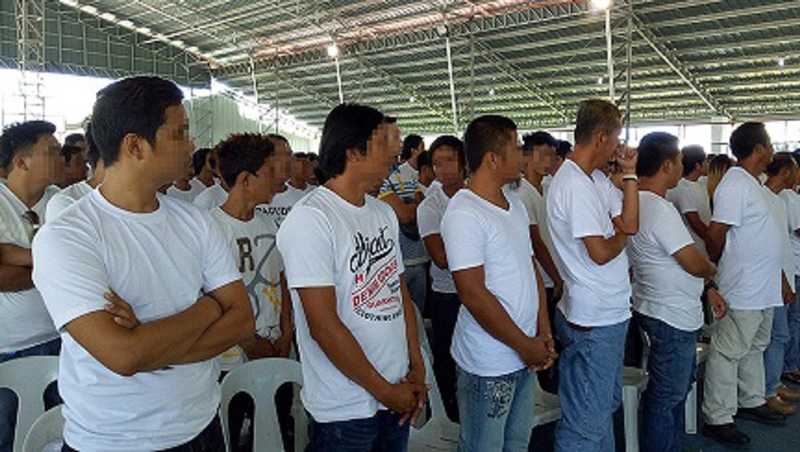 The non-commissioned survey was conducted from September 23-27 using face-to-face interviews of 1,500 adults with error margins of ±3 percent for national percentages, ±4 percent for Balance Luzon, and ±6 percent each for Metro Manila, the Visayas and Mindanao. 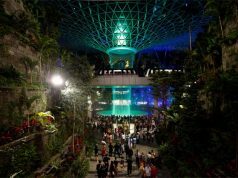 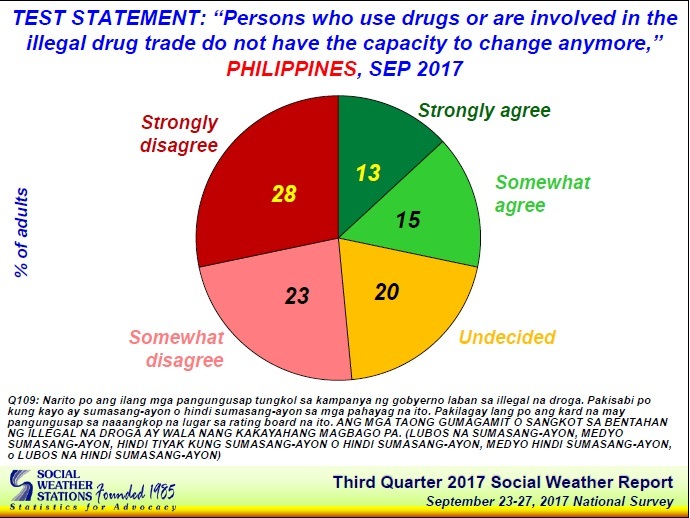 To the proposition that “Persons who use drugs or are involved in the illegal drug trade do not have the capacity to change anymore,” a claim Duterte himself has often made, 51 percent of the respondents disagreed (28 percent strongly disagree, 23 percent somewhat disagree), 28 percent agree (13 percent strongly agree, 15 percent somewhat agree), and 20 percent were undecided. 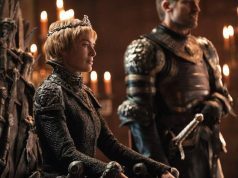 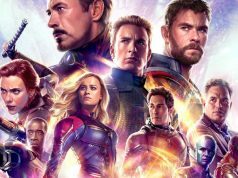 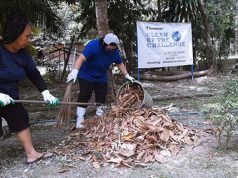 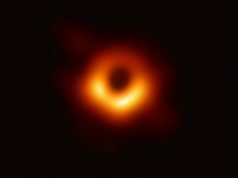 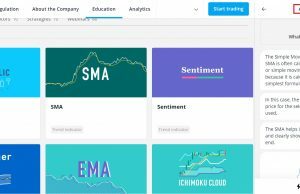 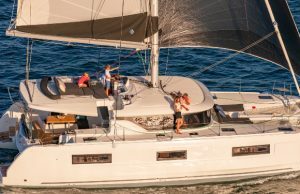 “This gives a net agreement score of moderately weak -23,” SWS said. 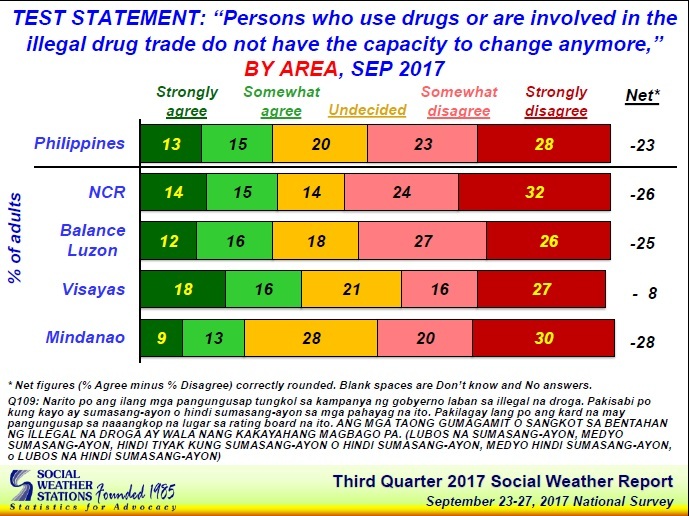 “Net agreement that persons who use drugs or are involved in the illegal drug trade do not have the capacity to change anymore was lowest in Mindanao at a moderately weak -28 (22 percent agree, 50 percent disagree), followed by Metro Manila at a moderately weak -26 (30 percent agree, 56 percent disagree), Balance Luzon at a moderately weak -25 (28 percent agree, 53 percent disagree), and Visayas at a neutral -8 (35 percent agree, 43 percent disagree),” it added. 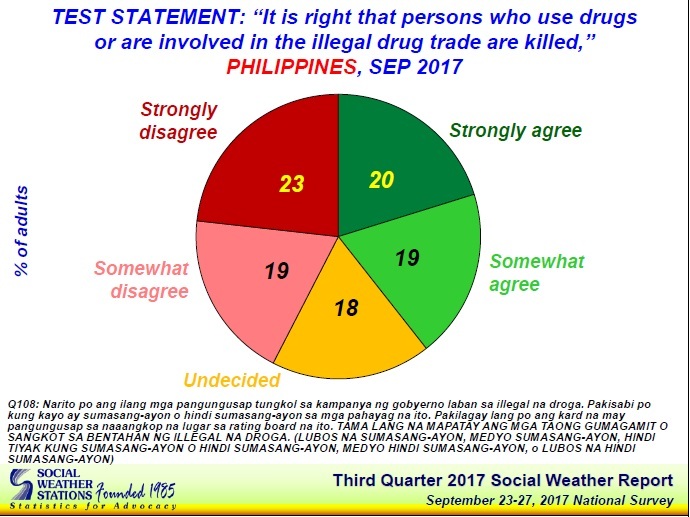 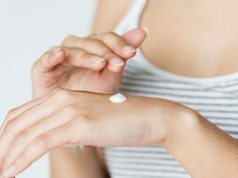 To the proposition, “It is right that persons who use drugs or are involved in the illegal drug trade are killed,” 42 percent of respondents disagreed (23 percent strongly disagree, 19 percent somewhat disagree), 39 percent agreed (20 percent strongly agree, 19 percent somewhat agree), and 18 percent were undecided, for a net agreement score of a “neutral” -3. 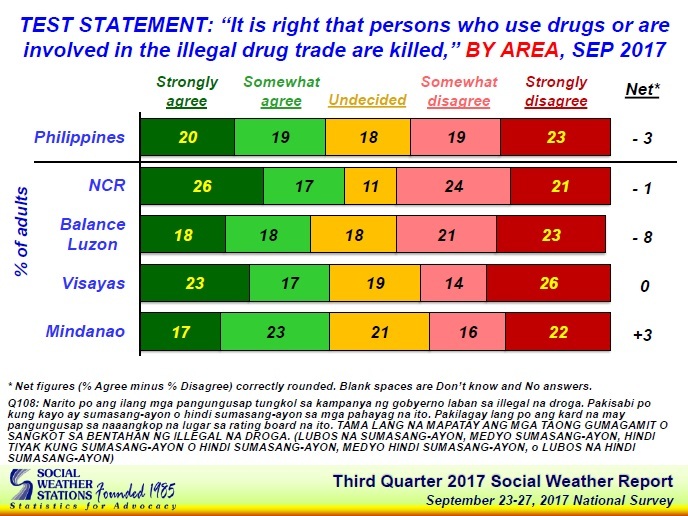 “Net agreement that it is right that persons who use drugs or are involved in the illegal drug trade are killed was neutral in all areas: it was +3 (41 percent agree, 38 percent disagree) in Mindanao, net zero (40 percent agree, 40 percent disagree) in the Visayas, -1 (44 percent agree, 45 percent disagree) in Metro Manila, and -8 (37 percent agree, 45 percent disagree) in Balance Luzon,” SWS said. 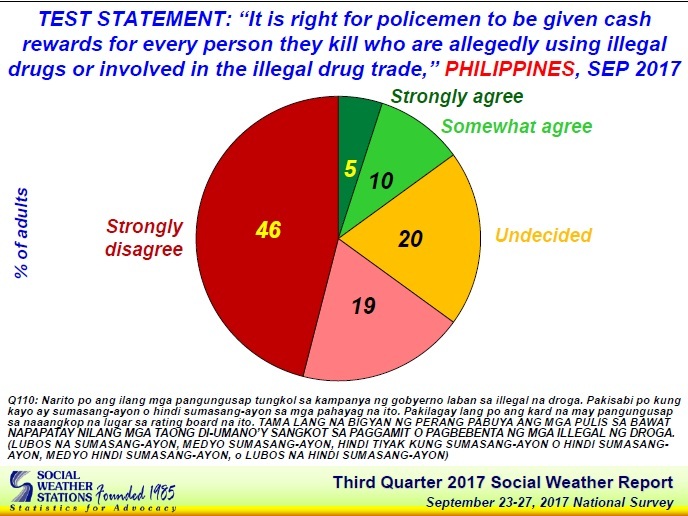 Asked whether “it is right for policemen to be given cash rewards for every person they kill who are allegedly using illegal drugs or involved in the illegal drug trade,” 65 percent of respondents disagreed (46 percent strongly disagree, 19 percent somewhat disagree), 15 percent agreed (5 percent strongly agree, 10 percent somewhat agree), and 20 percent were undecided, making for an “extremely weak” net agreement score of -50.